First things first, this session requires a helmet and starts at 1:00PM on Saturday, October 23rd. 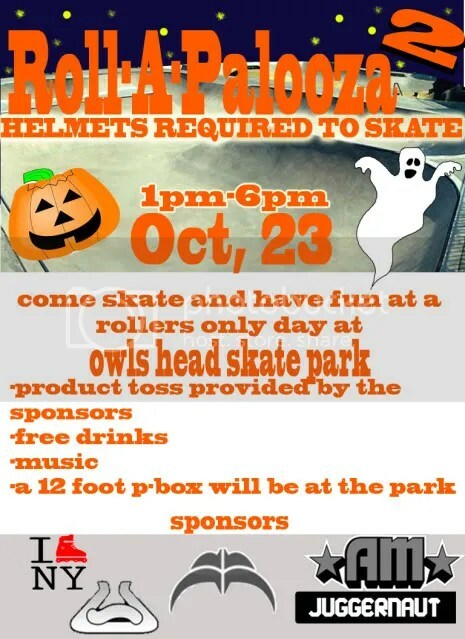 It is taking place in Owl’s Head park at the Millennium skatepark aka Owls Head skatepark. Along with the regular obstacles of the park there will also be a box added. There will be a product toss, free drinks, and music provided. This will be a blader only session meaning that we will be the only ones with access to the park until 6pm. Directions to the park via the MTA and car here. Walking directions from the train to the park here. Roll-A-Palooza Still on For Today! The chance of rain is slim and it’s not supposed to start till after today’s event in Owl’s Head Park in Brooklyn, NY so make sure you come out today. Get some free wheels, products, prizes, and of course some cash. Get all the info you need on the first post on Roll-A-Palooza. Roll-A-Palooza is still on for this Sunday, August 30th at 11am in Owl’s head park. Due to the slight chance of rain though, there will be a make up date, just in case, on Monday August 31st. This means that the event is still on for Sunday but if it happens to rain that day, the event will take place on Monday, August 31st. Sorry, I had to make it clear for all the people that thought the last LRNY session was on a Tuesday instead of the typical Wednesday because of a typo. Make sure you’re able to come out on either Sunday or Monday to get your shot at winning a free pair of brand new skates. This all depends on you guys. The more people that come, the more prizes, money, and products will be given out. Get all the info you need on the first post on Roll-A-Palooza. First things first, this session requires a helmet and starts at 11am on Sunday August 30th. It is taking place in Owl’s Head park at the Millennium skate park. Along with the regular obstacles of the park there will also be a prail and box added. There will be a product toss, prize money for best trick of the day, free drinks, and the first ten people get a set of free wheels. As well, this will be a blader only session meaning that we will be the only ones with access to the park until 5pm. As an added bonus Joey Rojas, the event coordinator, will be raffling off a free pair of skates to a lucky winner but only if the attendance is high enough. I think everyone wouldn’t mind winning a free pair of skates so make sure you and your friends are in attendance!